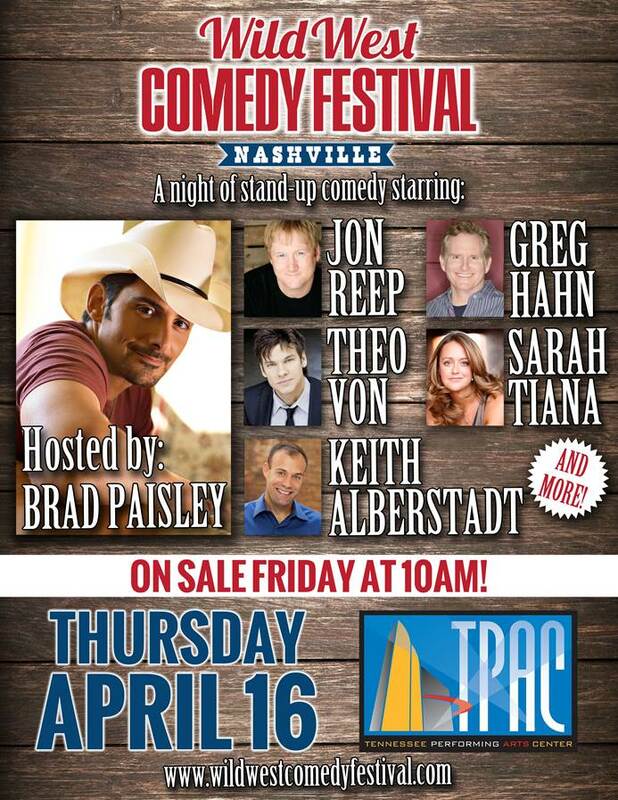 Country music superstar Brad Paisley will host a night of stand-up comedy featuring comedians Jon Reep, Greg Hahn, Theo Von, Sarah Tiana, Keith Alberstadt and more at TPAC’s Andrew Jackson Hall on Thursday, April 16 at 7:30 p.m., as part of the weeklong Wild West Comedy Festival. Year two of the festival is set for Tuesday, April 14 through Sunday, April 19 in Nashville, and brings a full slate of all-star comedians to its lineup. 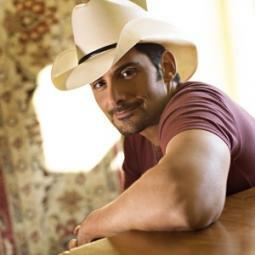 Tickets to the Paisley-hosted evening go on sale this Friday, March 27 at www.wildwestcomedyfestival.com. As host, Paisley will introduce and interact with each of the scheduled comedians. No stranger to the comedy world, Paisley has lent his voice to Comedy Central’s Emmy Award-winning, animated show “South Park” and has a flair of his own for comedic animation, humorous songs and goofball antics on tour. Paisley has fine-tuned his live comedic timing in his role as co-host of the CMA Awards, as a character on sitcoms and numerous appearances on television talk shows.This year’s Wild West Comedy Festival’s stellar lineup also includes previously announced performers Kevin Hart, Cristela Alonzo, Eric Andre, Doug Benson, Lewis Black, Hannibal Buress, Steve Byrne, Frank Caliendo, Jeff Garlin, Anjelah Johnson, Colin Jost, Nick Kroll, Joel McHale, John Mulaney, Tig Notaro, Jeanne Robertson and Rory Scovel. In addition, truTV’s Impractical Jokers will return with their all-new ‘Where’s Larry?’ Tour, starring The Tenderloins; and Kevin Smith and Jason Mewes will present their popular podcast Jay & Silent Bob Get Old. Filmmakers David Zucker and Jerry Zucker will oversee a screening of the classic comedy Airplane!, followed by an audience Q&A. More than 20,000 attended the inaugural festival in 2014, and were treated to more than 29 shows from the all-star lineup. Based on last year’s success, the 2015 event has added one day, extending the festival to a total of six days. Full schedule and ticket information is available at www.wildwestcomedyfestival.com. The festival’s venue partners include some of the most iconic locations in Nashville such as the Ryman Auditorium, TPAC's Andrew Jackson Hall and James K. Polk Theater, Bridgestone Arena, Belcourt Theatre, City Winery Nashville, Zanies.